Utah's location in the U.S.
Salt Lake County is a county located in the U.S. state of Utah. As of the 2010 census, the population was 1,029,655, making it the most populous county in Utah. Its county seat and largest city is Salt Lake City, the state capital. 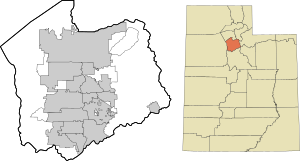 Salt Lake County occupies the Salt Lake Valley, as well as parts of the surrounding mountains, the Oquirrh Mountains to the west and the Wasatch Range to the east (essentially the entire watershed of the Jordan River north of the Traverse Mountains). In addition, the Great Salt Lake is partially within the northwestern section of the county. The county is famous for its ski resorts, which led to Salt Lake City hosting the 2002 Winter Olympics. Salt Lake County is part of the Salt Lake City, UT Metropolitan Statistical Area. The area that was to become Salt Lake County was settled in 1847 when Mormon pioneers of The Church of Jesus Christ of Latter-day Saints (LDS Church), fleeing persecution in the East, arrived in the Salt Lake Valley after traveling through Emigration Canyon. Brigham Young, their leader, declared "This is the place" after seeing the valley, which was at the time arid, dry, and unpromising. However, they soon developed a flourishing, self-sufficient city, Great Salt Lake City, through extensive irrigation techniques. Thousands of Mormons from around the world followed in the next several decades. The county was officially formed on January 31, 1850, with just over 11,000 residents recorded. Settlements were scattered across the valley and beyond, and the territorial capital was moved to Great Salt Lake City in 1857, when the name was subsequently shortened to Salt Lake City. In 1858, when the Utah Territory was declared in rebellion after governor Brigham Young refused to step down for The Church of Jesus Christ of Latter-day Saints' polygamous practices, the government sent troops to install a new governor and keep watch over the place. However, the valley was abandoned and the troops set up Camp Floyd to the south in Utah County. In 1862, Fort Douglas was established on the eastern bench, near the current site of the University of Utah, to make sure that the territory maintained its allegiance during the American Civil War. Patrick Edward Connor, who was the leader of the garrison stationed at Fort Douglas, was openly anti-Mormon and sent out parties to scout for mineral resources in the nearby mountains to encourage non-Mormons to settle there. During the late 19th century, mines were established in the Wasatch mountains, most notably around Alta (and nearby Park City in Summit County). Exploiting the mineral wealth was difficult until the Utah Central Railroad arrived in 1870. In the Oquirrh Mountains, the Bingham Canyon Mine, which contains vast deposits of copper and silver, came to be the most successful of the county's mines. The mine, located in the southwest portion of the county, attracted thousands of settlers to the narrow canyon. At its peak, the city of Bingham Canyon contained 20,000 residents all crowded along the steep walls of the canyon, and natural disasters were a frequent occurrence. By the early 20th century, most of the mines in the county had closed. However, the Bingham Canyon Mine kept on expanding, and today is among the largest open-pit mines in the world. After the railroad came to the county, the population began to expand more rapidly and non-Mormons began to settle in the city. During the early 20th century, heavy industry came to the valley as well, diversifying its economy, and local and interurban trolley systems were built covering the more urban northeastern quarter of the valley. The trolley system was mostly dismantled by 1945 as cars outpaced public transportation across the country. Throughout the late 19th and early 20th centuries, the east side of the valley began to be heavily-settled. In 1942, Camp Kearns, a massive military installation created for World War II, was created in what is now Kearns and Taylorsville on the western side of the valley. After the camp was closed in 1946, the land was sold off and rapid settlement of the area began. Other major defensive installations were set up along the Wasatch Front and in the Great Salt Lake Desert during World War II, further encouraging growth and boosting the economy, as well as establishing Utah as a major military center. In the nation-wide suburb boom of the late 1940s, 1950s, and early 1960s, such cities as South Salt Lake, Murray, Midvale, and much of the east side of the valley grew rapidly. The airport was upgraded to international status in the 1960s and became Salt Lake City International Airport. Like all of the industrialized cities throughout the nation, Salt Lake City faced inner-city decay beginning especially in the 1960s, while the suburbs grew tremendously. Growth in such cities as Sandy, West Jordan, and what would become West Valley City was phenomenal in the 1970s and 1980s. Huge residential tracts were created through the center of the valley, and within ten years, the entire area had been converted from farmland into sprawling bedroom communities to Salt Lake City. West Valley City was created from the merger of the three unincorporated cities of Granger, Hunter, and Redwood (including Chesterfield) in 1980. However, not every area of the county saw growth. Not only was Salt Lake City facing urban decay, but the cities that provided residences for the miners in Bingham Canyon were torn down in the 1960s and 1970s. The city of Bingham Canyon was completely torn down and swallowed up in the mine by 1972, and the dismantling of Lark in 1980 completed the process. The only remaining mining town in the county is Copperton, located southwest of West Jordan, with approximately 800 residents, though Magna continues to be associated with the mine's smelting operations in Garfield and at Arthur Mill. Beginning especially in the 1990s, rapid growth shifted further south and west. Old farmland and pastureland was swallowed up by new residential development. The cities of West Jordan, South Jordan, Riverton, Herriman, and Draper are some of the fastest growing cities in the state. During the 1990s, Salt Lake City began reversing the trend of inner-city decay, and its population grew for the first time in 40 years. Salt Lake City's selection as the host of the 2002 Winter Olympics spurred a construction boom in the city that continued well after the Olympics left, until a recession began in 2008. As the county's population has surpassed 1 million, one of the main issues in the county is urbanization. Only a few small rural areas remain in the far west of the valley. Other issues facing the county today include pollution and transportation. According to data from the LDS Church and the State of Utah, Salt Lake County was 53% LDS (Mormon) in 2004, as reported in the Salt Lake Tribune. By 2012, this had dropped to 51%. According to the U.S. Census Bureau, the county has a total area of 807 square miles (2,090 km2), of which 742 square miles (1,920 km2) is land and 65 square miles (170 km2) (8.1%) is water. The county borders on the Great Salt Lake and is intersected by the Jordan River. The western portion of the county descends toward the valley of the lake, but perhaps the most dominating physical feature in Salt Lake County are the Wasatch Mountains in the eastern portion of the county, famous for both summer and winter activities. The mountains are administered as part of the Wasatch-Cache National Forest. The snow in the region is often coined the "Greatest Snow on Earth" for its soft, powdery texture, and led to Salt Lake City winning the bid for the 2002 Winter Olympics. In Salt Lake County there are four ski resorts; Snowbird and Alta in Little Cottonwood Canyon and Solitude and Brighton in Big Cottonwood Canyon. Hiking and camping are especially popular summer activities. Marking the western portion of the county are the Oquirrh Mountains. These two mountain ranges together, along with the much smaller Traverse Mountains to the south of the valley, delimit Salt Lake Valley, which is also flanked on the northwest by the Great Salt Lake, and the north by the Salt Lake Anticline (most notably Ensign Peak). Salt Lake County and surrounding area as seen from above. On the north and east benches, the houses sometimes climb as far as halfway up the mountain, to the boundary of the national forest, and new communities are also being constructed on the southern and western slopes. Rapid residential construction continues in the west-central, southwest, and southern portions of the valley. In the far west, southwest, and northwest, rural areas still exist, but rapid growth threatens what remains of the natural environment in the valley. Mitigating this, the Salt Lake County government operates several large parks in the valley (even some that are within incorporated cities), including Big Cottonwood Park, Crestwood Park, and an Equestrian Center. The vast majority of traffic into and out of the Salt Lake Valley passes through only four geographic features, all of which are narrow. These are Parley's Canyon leading to Summit County to the east (as well as to Morgan County to the northeast via more remote Little Dell Canyon), the space between the Salt Lake Anticline and the Great Salt Lake leading into Davis County to the north, the Point of the Mountain and adjacent Jordan Narrows leading to Utah County to the south, and a space (known as Garfield) between the Oquirrh Mountains and the Great Salt Lake leading to Tooele County to the west. Of these, only the connection to Davis County to the north is wide enough and flat enough to accommodate transportation routes without reliance on earthworks. The Salt Lake Valley receives approximately 15 inches (380 mm) of precipitation annually, usually with more on the east side and less on the west side, as most storms come from the Pacific Ocean and the west side is in the rain shadow of the Oquirrh Mountains. Up to 500 mm is received on the east benches. Most of this precipitation is received in spring. The summer is dry, with the majority of precipitation arriving from the monsoon that rises from the south. Short, localized, and often dry thunderstorms are usually associated with the monsoon. However, some of them can be very intense. These storms can also cause flash floods and wildfires (due to dry lightning and powerful winds). Precipitation is heaviest in late fall/early winter and in spring, while early summer is the driest season. The valley receives 55 inches (140 cm) or more of snow in a year, with up to 100 inches (250 cm) received on the benches. Most of the snow falls from mid-November through March. The mountains receive up to 500 inches (1,270 cm) of light, dry snow and up to 55 inches (1400 mm) of precipitation annually. The dry snow is often considered good for skiing, contributing to the four ski resorts in the county. Snow usually falls from October through May. The heavy snow totals across the county can be attributed to the lake-effect, where precipitation is intensified by the warm waters of the Great Salt Lake, which never entirely freezes due to the lake's high salinity. The lake-effect can affect any area of the county. The dry snow is attributed to the low humidity of the region. During winter, temperature inversions are a common problem. The inversion will trap pollutants, moisture, and cold temperatures in the valley while the surrounding mountains enjoy warm temperatures and brilliant sunshine. This can cause some melting snow in the mountains and unhealthy air quality and low visibility in the valley. This weather event lasts from a few days to up to a month in extreme cases, and is caused by a very strong high pressure positioned over the Great Basin. As of the 2010 Census, there were 1,029,655 people, 343,218 households, and 291,686 families residing in the county. The population density was 1,274 people per square mile (791/km²). There were 364,031 housing units at an average density of 450 per square mile (279/km²). The racial makeup of the county was 81.2% White, 1.59% Black or African American, 0.89% Native American, 3.3% Asian, 1.53% Pacific Islander, 8.35% from other races, and 3.14% from two or more races. 17.09% of the population were Hispanic or Latino of any race. In 2010 there were 343,218 households out of which 40.10% had children under the age of 18 living with them, 57.80% were married couples living together, 10.40% had a female householder with no husband present, and 27.50% were non-families. 20.80% of all households were made up of individuals and 6.20% had someone living alone who was 65 years of age or older. The average household size was 3.00 and the average family size was 3.53. In the county, 30.50% of the population was under the age of 18, 12.90% from 18 to 24, 30.60% from 25 to 44, 18.00% from 45 to 64, and 8.10% who were 65 years of age or older. The median age was 29 years. For every 100 females there were 101.70 males. For every 100 females age 18 and over, there were 99.70 males. The median income for a household in the county was $48,373, and the median income for a family was $54,470. Males had a median income of $36,953 versus $26,105 for females. The per capita income for the county was $20,190. About 5.70% of families and 8.00% of the population were below the poverty line, including 9.00% of those under age 18 and 5.50% of those age 65 or over. The Census' 2005 American Community Survey indicated that 11.4% of Salt Lake County's population living in households (as opposed to group arrangements such as college dormitories) spoke Spanish at home. The region's economy used to revolve around LDS services and mining. While both are still important to the economy, they have declined in significance greatly since the 19th century. Since World War II, defense industries in the region have also played a very important role in the economy due to its strategic central location in the Western United States, as well as the largely uninhabited and desolate Great Salt Lake Desert to the west (used for training, weapons testing, and storage of hazardous materials). Beginning in 1939, with the opening of Alta Ski Area, skiing and other winter sports (as well as summer sports), have become a major force in the economy. In 1995, Salt Lake City won the bid to host the 2002 Winter Olympics. The 2002 Olympics boosted tourism and the economy, and helped to dramatically improve transportation throughout the county. Transportation has been a major focus, as the county continues to rapidly grow in population. It was drastically improved beginning in the late 80s and through the 90s, and continues to this day. Beginning in the 1960s, a more service-oriented economy began to develop, and information technologies began to arrive in the 80s and 90s. Although this business has waned in recent years, information and computer companies, such as Overstock.com, are still a thriving business here. Salt Lake County was originally governed from the Salt Lake City and County Building in Downtown Salt Lake City, but now is based at the Salt Lake County Government Center on State Street just north of Salt Lake City's border with South Salt Lake. Salt Lake County is unique in that it has a partisan county mayor. The current county mayor is Ben McAdams, a Democrat. Former county mayors include Peter Corroon, Nancy Workman and Alan Dayton (Workman's deputy mayor; sworn in as acting mayor in September 2004 when Nancy Workman was placed on paid administrative leave). The county has one major research university, the University of Utah. Westminster College and Salt Lake Community College also have large, well defined campuses in the county. Colleges with smaller, non-traditional campuses in the county include Broadview University, Eagle Gate College, LDS Business College, Newmont University, and Stevens-Henager College. Salt Lake County includes five separate public school districts. Salt Lake City and Murray operate their own school districts (although a recent annexation by Murray leaves a part of the city within the Granite School District). The Granite School District, the third largest in the state, is a broad district that covers a swath from Kearns and Taylorsville through West Valley City, Utah and eastward to South Salt Lake and Millcreek Township, among others. The Jordan School District, with approximately 48,000 students, covers the southwest part of the county, including West Jordan; the Canyons School District includes Sandy, and Draper. On November 6, 2007, the east side residents of the Jordan School District in Sandy, Draper, Midvale, Cottonwood Heights, and nearby unincorporated areas, voted to split from the Jordan District. A similar vote to make West Jordan its own district, however, failed. South High School in Salt Lake City closed in 1988; it is now occupied by the City Campus of the Salt Lake Community College (SLCC). Granite High School in South Salt Lake was reformed into an alternative school in 2006, although it remains a public school. However, this venture was not a financial success and the school closed in 2009. South Salt Lake has been trying to purchase the building for use as a community center. Non-traditional public high schools also include Horizonte and Valley, which was at one time located in the historic Crescent Elementary School building. In addition, the Roman Catholic Diocese of Salt Lake City operates 8 elementary schools, 1 middle school, 2 high schools, and 2 preschools in Salt Lake County. Judge Memorial Catholic High School in Salt Lake City is the largest Catholic high school in Utah. The Catholic Church also operates Juan Diego High School in Draper. Because there are only four major entrances to the Salt Lake Valley (to the north, east, and west of Salt Lake City proper as well as far to the south at Point of the Mountain), routes for long distance travel through the valley are mainly confined to an east-west strip through Salt Lake City and South Salt Lake and a north-south strip near the Jordan River. These corridors cross in the area between South Salt Lake and Downtown Salt Lake City and together form a latin cross of transportation infrastructure that is almost perfectly oriented north-to-south. Salt Lake City International Airport is the only airport with scheduled passenger service in the county, and South Valley Regional Airport is the only other public airport. Another small airport, Skypark Airport, is just to the north of Salt Lake County, however. The main runways of all of these airports are oriented approximately north-to-south (parallel to the Oquirrh and Wasatch mountains). All four major entrances to the Salt Lake Valley once carried rail traffic, but the line in Parley's Canyon was never built to high standards and was covered by Interstate 80 in the mid-20th century, leaving intact railroads only at the north, south, and west entrances to the valley. All three of these entrances carry passenger trains as well as freight: the Utah Transit Authority's (UTA) FrontRunner commuter rail line provides all-day service to Ogden (with select peak hour trips going to Pleasant View) on the north (via Davis County) and Provo on the south. Amtrak's California Zephyr runs once a day in each direction between Garfield and Point of the Mountain via Salt Lake City Station (on its route between Emeryville, California and Chicago, Illinois). Union Pacific controls all long distance freight tracks entering and leaving the county, though the Utah Railway, BNSF, and Salt Lake, Garfield, and Western have long-standing trackage rights. The Salt Lake City Southern and Savage Bingham and Garfield railroads operate totally within the county. A light rail system, known as TRAX, is operated by the Utah Transit Authority (UTA) and currently has three lines. The Blue Line runs from Downtown Salt Lake City to Draper), the Red Line from South Jordan to the University of Utah, and the Green Line from West Valley City to the Salt Lake City International Airport (via Downtown Salt Lake City). There are currently 50 stops in the system. The original line opened in 1999 from downtown to Sandy, with the line to the University of Utah completed in 2001, and to West Valley City and South Jordan in 2011. In April 2013 the extension to the airport (Airport Station) on the Green Line opened and the extension to Draper (Draper Town Center Station) on the Blue Line opened in August 2013. An historic streetcar was also expected to be constructed along 2100 South from the TRAX station to the historic business district in the Sugar House neighborhood. The proposal was refined, and a modern, rather than historic, streetcar system (S Line, formerly known as Sugar House Streetcar) operated by UTA is complete. It will open December 2013 and will run east from the Central Pointe TRAX Station to just east of Highland Drive in Sugar House. A future extension is planned to run north along Highland Drive and 1100 East to 1700 South. The county is traversed by three Interstate Highways and one U.S. Highway, as well as an additional freeway and one major expressway. US-89 enters from Davis County to the north and traverses the county arrow-straight until merging with I-15 in north Draper. It is known as State Street along most of the route and is the primary surface road in the valley. I-15 and I-80 intersect just west of Downtown Salt Lake City, merging for approximately 3 miles (4.8 km) north-to-south. I-80 continues west past the Salt Lake City International Airport and east through Parley's Canyon and into the Wasatch Range. I-15 traverses the valley north-to-south, providing access to the entire urban corridor. The freeway is 10-12 lanes wide after a major expansion project from 1998 to 2001 undertaken in preparation for the 2002 Winter Olympics. I-215 directly serves many of the suburbs of Salt Lake City in the western, central, and eastern portions of the valley in a 270° loop. SR-201, alternatively known as the "21st South Freeway", provides access to West Valley City and the west side of the valley. Bangerter Highway (SR-154) is an expressway that traverses the entire western end of the valley from the airport, ending at I-15 in southern Draper. SR-68, or Redwood Road, is the only surface street that traverses the entire valley from north-to-south. The Legacy Parkway opened in 2008 to connect with I-215 at the north end of the valley, providing an alternative route into Davis County to alleviate congestion. The Mountain View Corridor is a freeway planned to be constructed down the far west side of the valley - construction began in 2010. The Utah Transit Authority operates bus routes throughout the valley and along the Wasatch Front, to Park City and Tooele, and to the ski resorts in winter. The Jordan River Parkway trail (and its northern extension, the Legacy Parkway trail) runs north-south in the center of the valley from Utah County to Davis County (though it has a few gaps), and the planned Crosstown and Parley's trails will together form the primary east-west route from Parley's Canyon to Garfield. The Bonneville Shoreline Trail runs along the face of the Wasatch mountains, skirting the edge of the built up areas of the east bench, though there are large gaps in the central part of the county. A large number of more remote trails provide access throughout the Wasatch-Cache National Forest. The county has created "townships" and "community councils" in unincorporated areas, largely for planning purposes only. As of 2010, all of the townships are also census-designated places (CDPs), but the boundaries set by the Census Bureau and the county do not always coincide. Bingham Canyon, incorporated 1904, disincorporated 1971. The last buildings were razed in 1972 as the Bingham Canyon Mine absorbed the town. At its peak its population was around 15,000. Forest Dale, incorporated 1902, disincorporated 1912 and subsequently annexed by Salt Lake City. Lark was a small town on the southwest side of the valley that was dismantled entirely in 1978 to make way for overburden from the Bingham Canyon Mine. At its peak its population was around 800. Unified Police Department of Greater Salt Lake, Police department for unincorporated Salt Lake County. Parley Parker Christensen, Utah and California politician. County attorney. ^ a b "State & County QuickFacts". United States Census Bureau. http://quickfacts.census.gov/qfd/states/49/49035.html. Retrieved December 29, 2013. ^ Arave, Lynn (January 5, 2006). "Tidbits of history — Unusual highlights of Salt Lake County". Deseret Morning News. pp. S1-S2. http://deseretnews.com/dn/view/0,1249,650218849,00.html. Retrieved 2007-01-05. "Salt Lake". The American Cyclopædia. 1879. ^ "U.S. Decennial Census". United States Census Bureau. http://www.census.gov/prod/www/decennial.html. Retrieved December 29, 2013. ^ "Historical Census Browser". University of Virginia Library. http://mapserver.lib.virginia.edu. Retrieved December 29, 2013. ^ "Population of Counties by Decennial Census: 1900 to 1990". United States Census Bureau. http://www.census.gov/population/cencounts/ut190090.txt. Retrieved December 29, 2013. ^ "Census 2000 PHC-T-4. Ranking Tables for Counties: 1990 and 2000". United States Census Bureau. http://www.census.gov/population/www/cen2000/briefs/phc-t4/tables/tab02.pdf. Retrieved December 29, 2013. ^ Religions in Salt Lake County, Utah - Salt Lake City, West Valley City, Sandy, West Jordan, Taylorsville, LDS (Mormon) Church, Catholic Church, Southern Baptist Convention. City-data.com. Retrieved on 2013-07-21. ^ "Salt Lake County Assessor's Office". http://assessor.slco.org/. ^ "Salt Lake County Auditor's Office". http://auditor.slco.org/. ^ "Salt Lake County Clerk". http://clerk.slco.org/. ^ "Salt Lake County District Attorney". http://www.districtattorney.slco.org/. ^ "Salt Lake County Recorder". http://www.slcorecorder.org/SLCR/Home.aspx. ^ "Salt Lake County Sheriff". http://www.slsheriff.org/. ^ "Salt Lake County Surveyor". http://www.surveyor.slco.org/. ^ "Salt Lake County Treasurer". http://www.treasurer.slco.org/. ^ Toomer-Cook, Jennifer (November 7, 2007). "East side votes to split Jordan District". Deseret Morning News. http://www.deseretnews.com/article/1,5143,695225545,00.html. Retrieved 2009-06-30. ^ Palmer, Rebecca (February 16, 2008). "South S.L. makeover to begin within week". Deseret Morning News. http://www.deseretnews.com/article/695253748/South-SL-makeover-to-begin-within-week.html. Retrieved 2009-06-30. ^ Davidson, Lee (28 Aug 2013). "Sugar House streetcar testing begins next week". The Salt Lake Tribune (Salt Lake City: MediaNews Group). http://www.sltrib.com/sltrib/politics/56795317-90/east-goeres-stops-trains.html.csp. Retrieved 17 Sep 2013. This page uses content from the English language Wikipedia. The original content was at Salt Lake County, Utah. The list of authors can be seen in the page history. As with this Familypedia wiki, the content of Wikipedia is available under the Creative Commons License.